Admission: access is included in the ordinary ticket, according to the opening hours of the Archaeological Park of the Colosseum. The Archaeological Park of the Colosseum starts today offering the public the new permanent exhibition of the Colosseum, enriched with multimedia contents and finds from the recent researches coordinated by Rossella Rea, in collaboration with the University of Roma Tre and The German Archaeological Institute of Rome. 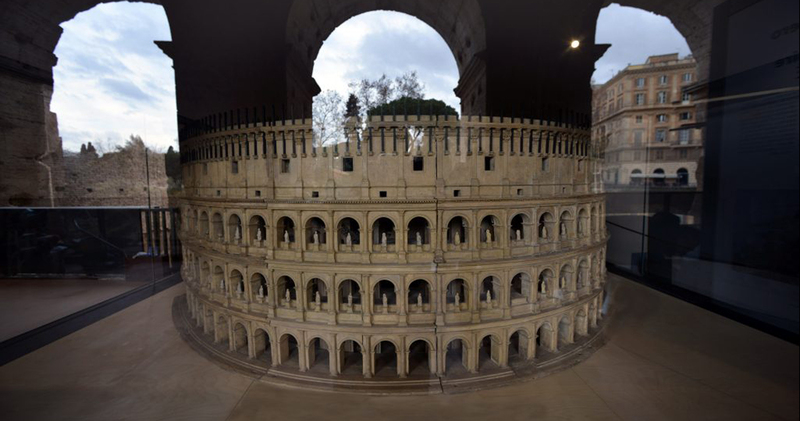 The exhibition has eleven main sections, with testimonies of architecture and daily life within the Flavian Amphitheatre, of the post-ancient transformations, and of modern and contemporary age travelers and artists. Starting from today, visitors will be welcomed and guided by videos of experimental archeology, such as the one on the functioning of the hoists of the underground levels, suggestive slideshows with 19th century pictorial interpretations of the monument, and a precious film from Istituto Luce archives, giving evidence of the religious celebrations held on the arena floor during the Fascist period. In order to promote the knowledge and awareness of the international public of the Park, the director Alfonsina Russo has chosen to open up to the Far East by adopting a communication apparatus in Chinese, as well as in English, order to tell the multifaceted story of this universal symbol.